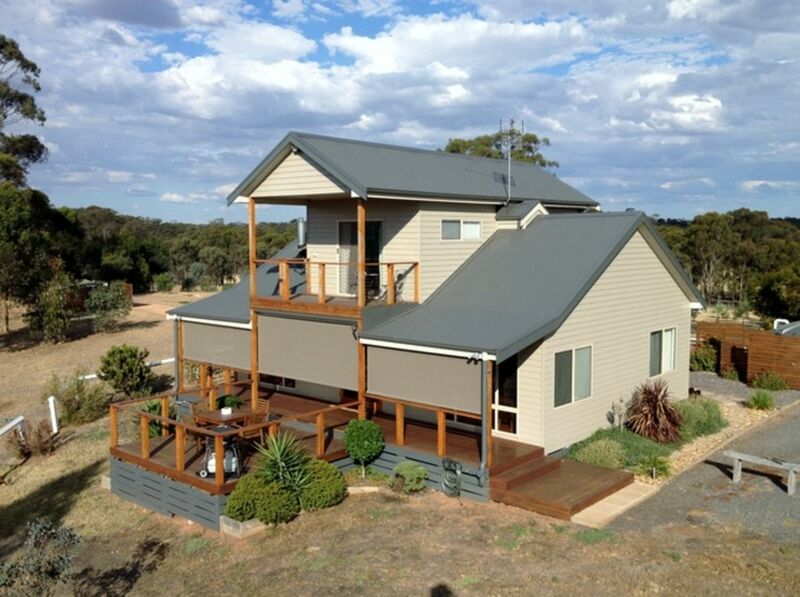 Fully equiped 2 bedroom self-contained Cottage built 2010 on 50 acres with woodfire and spa-bath. Perfect for a weekend getaway. An open plan and comfortable living area comprises lounge with wood heater (wood provided), eating area and fully equipped gourmet kitchen. A twin bedroom and bathroom complete the ground floor. A full length verandah faces west for views of the Pyrenees ranges, whilst an east facing verandah is perfect for breakfast in the morning sunshine. Beautifully appointed for a relaxing time away. Close to Avoca and otherparts of the Pyranees. Wonderfully clean. Well equipped kitchen which we used for a couple of breakfasts and a dinner in. Comfy beds, big and relaxing spa, very clean bathrooms. Great sound system to go with our music dvd collection. Surrounds not as green this time but large number of different birds spotted still. Wow. Just wow. Even the finer details and thought put into this property is meticulous. From torches to umbrellas, and everything in between. We have stayed many places but Bung Bong Hill Cottage surpasses all with ease. Will definitely be back. Thankyou for sharing your home away from home. Truly amazing. Beautiful location, lovely clean and well presented. Highly recommend for time away to relax, unwind and enjoy the view! Beautiful, tranquil escape from it all! Thank you for the four night wonderful stay this summer. The property is beautiful and immaculately kept. One of the nicest we've stayed in all of Victoria. We loved the long walks around the property, the mobs of kangaroos in the morning and evening, bbqs with beautiful sunsets on the back veranda and star gazing at night. We were hoping to allow our two huskies to run free and explore but unfortunately the fencing was low in areas and too easy to get through. Still, we enjoyed long walks on lead morning, moon and night. We very much appreciate a puppy friendly house. We would be back if the veranda was fully enclosed to allow us to relax with the dogs off lead. This cottage is incredible. Situated on a beautiful 50 acres The home was wonderful for our stay. So clean and absolutely everything you could need to be comfortable. We will certainly be staying again. Amazing property. Loved our stay. Loved the property, perfect base to explore the Pyrenees wine region.